Sunday was Bill’s fifth of five classes at Westminster Presbyterian Church here in Dayton on the history of Protestant fundamentalism. As was the case the first four weeks, there were approximately thirty people in attendance, and the discussion was very lively, with many great questions. Given that this final class brought the story of fundamentalism up to the present, many of the questions were particularly pointed and poignant. 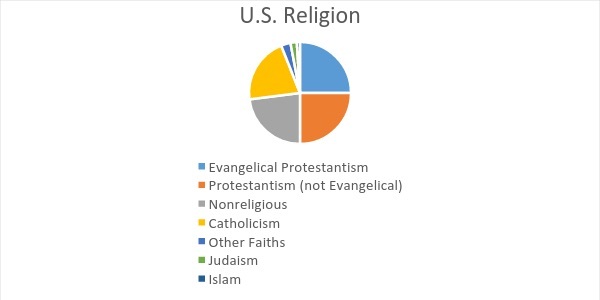 What percentage of Christians in the US are evangelicals/fundamentalists? When Bill answered this question with “approximately 25%” he was thinking of the data captured by the 2015 Pew Religious Survey, which established that approximately 25% of all Americans are evangelical. But if we pull out Jews, Muslims, other faiths, and the nonreligious, the percentage of evangelicals jumps to 35%. If we limit ourselves to Protestants, approximately half are evangelicals. Can you talk about the ways in which the fundamentalist movement has torn apart denominations, churches, and families? The fundamentalist movement has been a remarkably divisive force in American Protestantism for the past century. As regards denominations, one of the most recent examples is the fundamentalist takeover of the Southern Baptist Convention, which involved students serving as spies in seminary classrooms, and which resulted in a host of academics and pastors finding themselves without jobs. As regards churches, the examples are legion, and go all the way back to the 1920s. But what has happened in families may be the most heartbreaking. Sue and I have heard so many stories – even some from people who attended the Westminster classes – of family members being attacked (publicly and privately) and shunned for their failure to hold to this or that fundamentalist tenet. For Bill, the most painful moment came when he gave two talks on fundamentalism at a local church that welcomes members of the LGBTQ community. In the Q and A afterward person after person talked and wept as they told their stories about how their fundamentalist parents and siblings and friends and churches completely rejected them. For Bill, it was a miracle that they are determined to remain Christian. Do evangelicals/fundamentalists like Trump because he speaks in superlatives and certainties, as everything can be reduced to black or white? That is some pretty powerful certainty! What if you are a moderate Republican, and you don’t want to go with the liberals in the Democratic Party, but you don’t want to be part of a Republican Party that is now dominated by the Tea Party/Christian Right? What are you to do? You don’t have good options, because you have lost your party. You can organize and take back the party – your best bet here is to hope that the 2018 elections are a disaster for the Republicans. Or, you can organize with an eye to creating a new political party. Or, you can decide joining with the Democrats is better than your other options. The Christian Right is the most important constituency in the Republican Party, and they are not going away any time soon. Thanks, Westminster, for your gracious hospitality and your lively engagement!